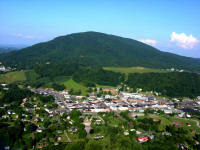 Ashe County is located in northwestern North Carolina's High Country. A couple of centuries past, Ashe was known as the Lost Provinces: in the winter, the only way to get into or out of county was to be born or die. Lately, not so much. Ashe Countians can reach anywhere in the globe from the comfort of our drafty, boulder-perched cabins, as long as the Wi-Fi holds out. At present, the design is experimental. Please bear with us as we develop. New features and links may appear without warning.